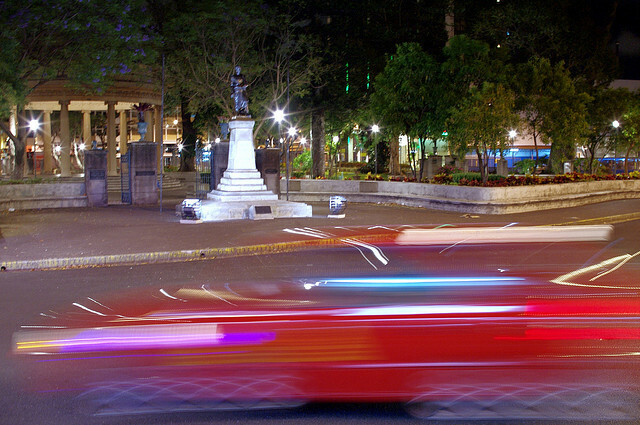 A cab driver works late into the night in San Jose, Costa Rica. Photo by Pablo.Robles. The 2011 Latin American Carbon Forum wrapped up in San Jose, Costa Rica last week. The forum was created as a platform to discuss the global carbon market and present policy analysis for climate change mitigation. The event was also an opportunity for market assessments, as well as for the exchange of knowledge and ideas between private sector actors. The event aimed at tackling three issues currently at debate in the sector: the uncertainty in the architecture of the carbon market post-2012, the increasing fragmentation of the market, and how to best use the abundance of emerging mechanisms and sources of climate finance. Government representatives, designated national authorities, technology and service providers, development banks, as well as non-governmental organization and academic institutions were involved in the forum’s events. The annual conference and exhibition was co-organized by the World Bank, the International Association for Emissions Trading (IETA), the Latin American Energy Organization (OLADE), the UNEP Risoe Centre, the Inter-American Development Bank (IDB), the Framework Convention and the United Nations Climate Change Program (UNFCCC). For those of you interested in carbon financing for the transport sector, join the Transport and Climate Change virtual community on the newly launched Finanzas de Carbono platform. The Spanish-language website, with a special focus on Latin America, is supported by the Inter-American Development Bank, the World Bank and the United Nations Environmental Program. The portal has specific communities for all the main climate change topics, including energy, transport and financing institutions. The community has an online library where publications, videos and links can be shared; a calendar section to promote events; and a discussion board. There are also some general documents to help people understand the role of transport in climate change. In the following weeks, the community will also be organizing webminars and web discussions.